"You can customize these simple wraps by topping them with whatever your family likes. Try shredded cheese, tomatoes, or onions." 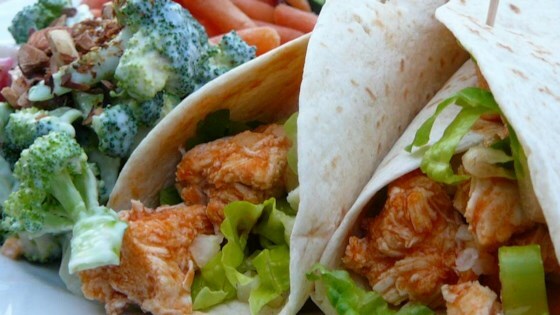 Buffalo chicken gets reinvented in this lettuce-wrapped, healthy version. I always use leftover chicken for these and they're great for lunch. I make my own wing sauce and add some shredded cheese. These are a favorite in our house! You can't get much easier than this. It was also very tasty! I didn't have blue cheese, so used ranch. My daughter and I enjoyed it. Quick, easy and good! Used 2 cups of buffalo sauce instead of hot sauce. Used blue cheese crumbles, tomatoes, lettuce and ranch dressing and was perfect.